The No. 9 ranked Stanford Cardinals beat the Cal Poly Mustangs despite dropping the second and third sets in their second match of the Stanford Invitational. The Cardinals bounced back after losing their five-set match against the No. 20 Purdue Boilermakers on Friday in their first match of the tournament. In terms of offense, Stanford led Cal Poly with a .310 hitting average and 63 total kills for the match. Cal Poly hit .156 and had 57 total kills. The Cardinals also led the Mustangs in aces, 7 to 5. Stanford’s Merete Lutz had 17 kills, while Inky Ajanaku and Audriana Fitzmorris each had 14. For Cal Poly, Alexis Clewis equaled Lutz with 17 kills of her own, and Raeann Greisen and Adlee Van Winden contributed 12 kills apiece. Taylor Nelson of Cal Poly had the most assists in the match with 49, and Kelsey Humphreys and Jenna Gray of Stanford both tallied 25 assists. Notably, Stanford was head-and-shoulders above Cal Poly in the blocking department, totaling 18 blocks to the Mustangs’ 4. Ajanaku and Kathryn Plummer each had 10 blocks, while Fitzmorris contributed 7. For Cal Poly, Nelson, Greisen and Savannah Niemen each had 2 blocks. Cal Poly, however, did best Stanford in total digs, extending 59 rallies to the Cardinals’ 54. Van Winden led Cal Poly with 14 digs, and Stanford’s Morgan Hentz had 21. Stanford will travel to Moraga, California next Friday, September 16th, to take on Saint Mary’s. Cal Poly’s next match will also be on Friday, and they’ll face Grand Canyon in the Sacramento State Invitational. 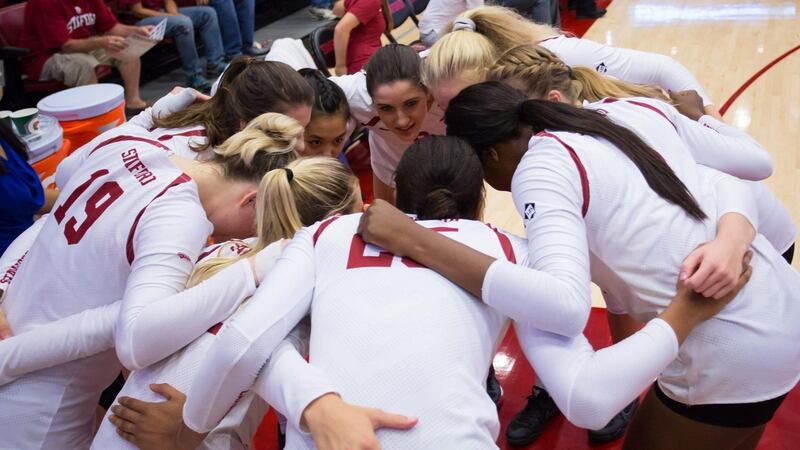 STANFORD, Calif. – Behind redshirt junior Merete Lutz‘s season-high 17 kills, the ninth-ranked Stanford women’s volleyball team came from behind to defeat Cal Poly, 25-14, 23-25, 27-25, 25-13, 15-10, Sunday at Maples Pavilion. Redshirt senior middle blocker Inky Ajanaku hit a match-best .500 and turned in her first career double-double with 14 kills and 10 blocks. The 10 blocks matched her career-high, set during her freshman season in 2012, and moved her into seventh-place past Jenn Harvey (2000-03) on the school’s all-time blocks list. Stanford’s setters, senior Kelsey Humphreys and freshman Jenna Gray, each had 25 assists in the match. Humphreys also posted a career-high 12 digs for her first double-double of the season. Sophomore outside hitter Hayley Hodson was a kill shy of a double-double (9 kills, 10 digs), while freshman Michaela Keefe provided a spark off the bench in the third set and started the fourth. Stanford will play its next six matches on the road, starting with Saint Mary’s (Sept. 16) and Pacific (Sept. 17). Next week’s matches will conclude nonconference play for the Cardinal. Cal Poly Athletics had not issued a press release at the time of this article’s posting.